The Annual Disaster Statistical Review 2012 has been published by the Centre for Research Into the Epidimiology of Disasters in Belgium. This UN body compiles all the disaster statistics – an un-glamorous task but an essential one. We thank them for an independent review of the number and impact of disasters on this world. We are sorry about last year’s cover – but there is no on line image of the new one! The Annual Disaster Statistical Review 2012 reports 357 natural triggered disasters as registered last year. This was less than the average annual disaster frequency observed from 2002 to 2011 (394). It also represented a decrease in associated human impacts of disasters in 2012, which were at their lowest level compared to previous years. However, natural disasters still killed a significant number. A total of 9,655 people were killed (annual average 2002-2011:107,000). About 50% of these were from flooding. Also 124.5 million people become victims worldwide. This is a lot less than the average from 2002-2011 of 268 million. Contrary to other indicators, economic damage from natural disasters did show an increase to above average levels. Estimates placed the figure at US$ 157 billion (143 billion 2012 US $). Economic damage is not an indicator that we use much. It depends a lot on the country affected. In developing countries, the economic numbers may be small, but the low number may be a big percentage of a developing country’s GDP. That could have a really big impact. Why is the Annual Disaster Statistical Review 2012 important to us? 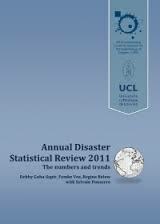 The Annual Disaster Statistical Review 2012 is important to us. It helps us track the need for a rapid disaster response. So it helps us stay on track with our aims and objectives. It also helps us keep our disaster response relevant. If you want to help us with our response to needy people affected by these events then why not give to Wings Like Eagles? Or, if you want to know more about our work , why not contact us? Thank you.